Spring has arrived, encouraging everyone to enjoy the beautiful lake, the delicious food, and colorful sunburst chairs, which will continue to decorate the Terrace as the Memorial Union Reinvestment continues. While many worry the construction will diminish the Memorial Union’s traditional iconic symbol, the Design Team, campus Facilities, Planning and Management, the State of Wisconsin, the Wisconsin Historical Society and student representatives are all working together to make sure the Memorial Union stays true to its original character. To help ensure this, it is important to understand the history of the Memorial Union and where it is today. 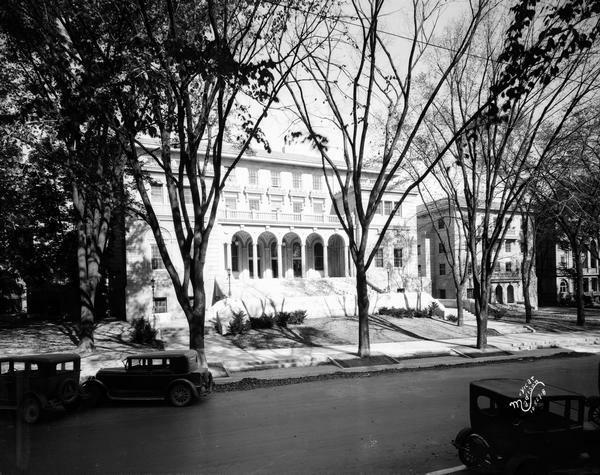 When the Memorial Union was built in 1927, it followed a neoclassical style, a very popular architectural type for civic buildings at the time. Neoclassical style draws from Greek and Roman architecture and was made popular in the United States at Chicago World’s Fair in 1893. The main exhibition buildings were all designed in neoclassical architecture, later influencing the style for all sorts of buildings like public libraries, city halls, state capitols, university buildings, and more. The Memorial Union itself was built on the very tail end of neoclassicism. Ten years after its construction, an addition was added to house the WIsconsin Union Theater. The builders chose not to copy the architecture style of the original building but designed the addition in a modernistic way that echoed the international style that was popular in the 1930s. Though more modern in structure, the addition stayed respectful to what had already been built by using materials, datum lines, steel, and massing from the original building. “The most beautiful thing about the addition is the way it budded up against the original building and very seamlessly transitioned from this neoclassical historical design to modern design,” said Jim Draeger, Deputy State Historic Preservation Officer at the Wisconsin Historical Society. “As the building […] turns the corner on Park St. it becomes modern, but until it turns the corner, it’s historic. From architecture’s standpoint, it was a masterful design,” he said. Ever since the construction and addition to the Memorial Union, no other major renovation had taken place for 83 years – until now. Memorial Union Theater in 1940. 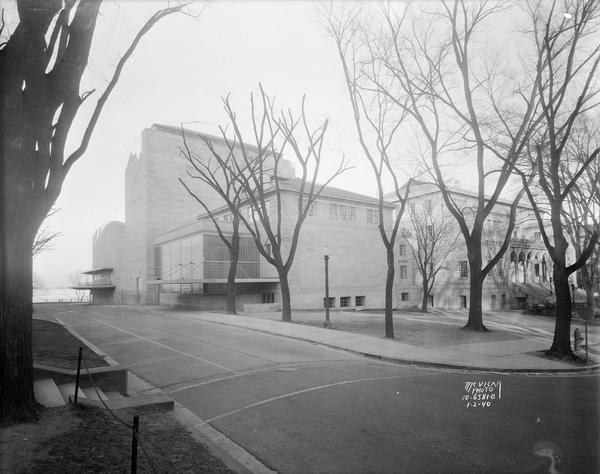 “With a building like Memorial Union, the historic preservation issues are very complex because of the scale of the building, the history of its use over time, the way the addition was put onto the building in 1937, and its incredibly varied uses. There aren’t a lot of buildings like the Memorial Union that have a huge variety of uses,” said Jim. For this reason, the planning and designing of this renovation consisted of weekly meetings between the Design Team, the State of Wisconsin, Union staff, the Historical Society and student leadership to maintain the original character of the building. “The art of historic preservation is to find the points where historic preservation can align with those interests where you can find an alternative way of doing something or find a solution that has less impact on a building,” said Jim. For example, if a set of stairs were planned to be in front of a historic block window, the Historical Society would review the design, and make recommendations to the architects for alternate stairs locations. To keep this historic building’s character, the stone on the outer walls of the former west wing will be reused to create the new west wing. Before removing the stone, the design team created a 3D scan of the structure to make note of the stones and their location in relation to the exterior of the building. This will allow the stones to be put back where they belong during renovation. During the move-out phase, Theater staff discovered an old crate full of documentation related to the Theater’s design and construction. These documents were exhibited at the Groundbreaking Ceremony. Melanie Taylor, Project Manager with Boldt Construction, saw an elevation that showed the shop drawing of the different dimension of stone. “At that point we knew back then they had an intention of having stone with varying sizes, which blows my mind because it is not something you ever encounter today,” said Melanie. Today, same-sized stone is used in order to speed up the construction process. In the case of the Memorial Union west wing, however, the original stone is being removed and reused so the stones will continue to differ in size. It’s even more important that each stone be returned to its original location so as not to throw off the entire stone placement. This discovery showed that 1937 stone tolerances and the data scanner were not to blame for the different sized stone mystery. “I do not know if whether the shop drawings on the display were as-built drawings saying hey here’s the actual stone, and we went and measured each piece and here’s what is it is. Or if they planned on building it that way with slightly different sizes,” said Melanie. As a student at this school I am very excited to see the transition and if people will use the new spaces created as intended or make it their own. I hope that you, too, can be one of those people. If you’re curious to see what construction is looking like right now at Memorial Union and on Langdon St., feel free to view the slideshow below. Photos by Brooke Appe. If you would like to learn more about how the Union works with the Wisconsin State Historical Society, check out the following video of Jim Draeger, Deputy State Historic Preservation Officer. Mishali Patel is a senior majoring in Industrial & Systems Engineering with a certificate in Entrepreneurship. She currently serves as the Student Construction Representative on the Memorial Union Reinvestment.